It’s not what you think!…okay, may be a little. I will be talking about picking chickweed. What weed?? Chickweed, also known as starweed, is a cooling and alkalizing herb. My walk at High Park, Toronto this past weekend inspired my new kitchen creations at home. I leaned all about Herbal Medicine and Edible Weeds from my Herbal teacher Susan Elliotson. She owns an amazing property at Caledon, Ontario where she teaches students Herbal Pharmacy courses. Learning from Susan made me fall in love with herbs and edible greens. I also met Karen Stephenson at Susan’s place who is a wild edible enthusiast. Karen is all about wild foraging, and incorporating edible wild foods or weeds into her diet. When invited for the “wild edible walk in the park” this weekend I just couldn’t resist! Simply put she knows her local weeds that nature offers for free! 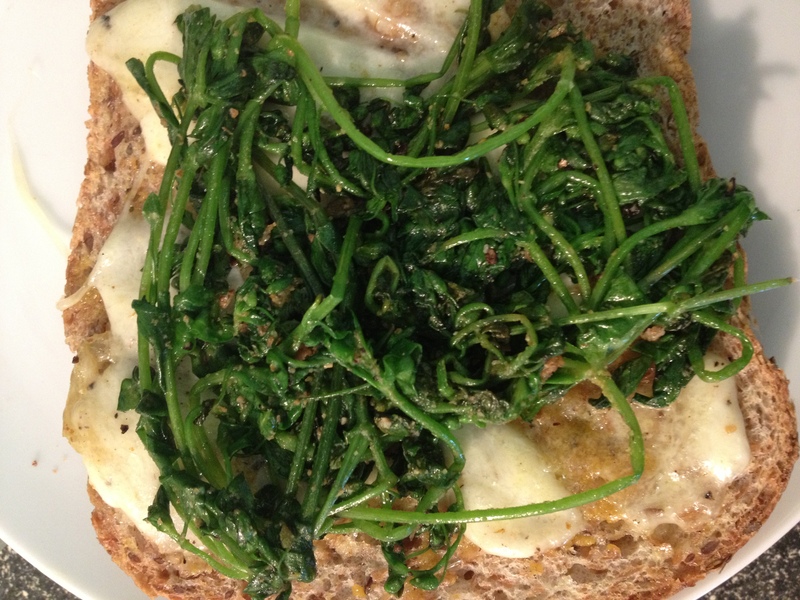 I have long been waiting for Chickweed to make a Grilled Cheese Sandwich and Chickweed Pesto! Upon my request Karen brought me a bag full of chickweed for me to play with in my kitchen. You can rely on many weeds for food and medicine. Chickweed is no different. Chickweed can be found settled nicely into local landscape and is among the most popular herbal remedies today. It is an annual plant that grows in many locations in Ontario. It is an easy to grow plant that grows in a unique intertwined manner. 1 If you are interested in harvesting your own Chickweed check with your local park or local native plant societies or your backyard. Just make sure no herbicide or pesticide was sprayed around that area and it is not near the highways (lots of pollution). There are many books on how to pick wild foods that you can check out. Before I talk about what I did with my “bag of Chickweed”, I want to share a little bit more about Chickweed and the benefits of this amazing wild edible! Stellaria media or Chickweed is sweet and mildly bitter in taste. It is mild enough to be eaten safely, raw in your salad. Stellaria is Chickweed’s genus name that means “star.” The tiny white star like flowers of the plant is responsible for its name. Chickweed if known to be found anywhere in the world, where there is moist and cultivated soil.2 Instead of trying to figure out how to get rid of this weed from your backyard add it to your diet for its nutritional and healing properties. Leaves: Chickweed leaves can be used for salads, pesto sauce, sandwiches, soups and stews. 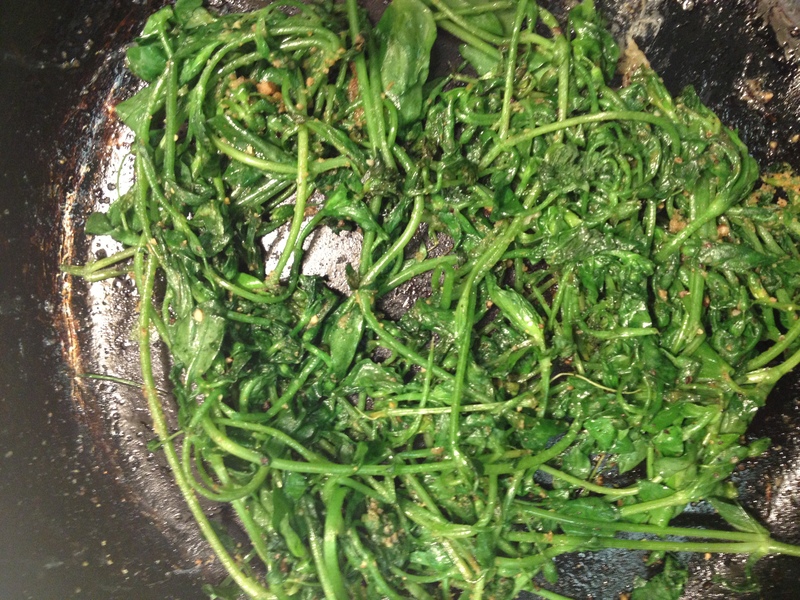 Stems: The stems from Chickweed can be used for soups and stews. Flowers: Chickweed also produces edible flower parts that can be used in salads and soups. Chickweed is well known for its emollient (plants that are used externally to soften and soothe) and demulcent (plants that relieves irritation) properties. It is a major herb for relieving skin irritation and eye inflammation, kidney and liver disorders. Beneficial for the Skin: Chickweed makes excellent poultice for skin irritation such as rashes and itchiness. I have personally used Chickweed Salve to conquer itchy skin when I had hives. It is also used to treat eczema, psoriasis, boils and nettle stings. Nutrition: Chickweed is packed with nutritional substances. It is an excellent source of Vitamin A, all the B Vitamins, Vitamin C and Vitamin D. Crucial minerals such as copper, iron, calcium, magnesium, manganese, potassium, phosphorus, selenium, sodium, silica and zinc. It is high in chlorophyll and also contains omega-6 fatty acids, protein, carotenoids, coumarins and bio-flavonoid.4 Saponins in the Chickweed, like soap, emulsify and increase the permeability of cellular membranes. This increases our body’s ability to absorb nutrients, especially minerals.5 The saponins also break down the fat cells. Thyroid: Chickweed also nourishes and regulates thyroid functions. Thus have an effect on our metabolism. In a small pan add oil and stir in the chickweed. Add lemon juice, salt, pepper and cumin. Cook for 3-4 minutes and turn off the heat. Toast the bread slices and butter it up. Add the cheese slices and sprinkle black pepper on it. In the same pan you cooked the chickweed, lightly fry the cheese for a minute. On the toast, put the melted cheese and the chickweed on top. Butter the other slice of bread and make a sandwich. Thank-you so much for the compliments Nahid, I truly appreciate it! It was fabulous seeing you and I love what you did with the chickweed!